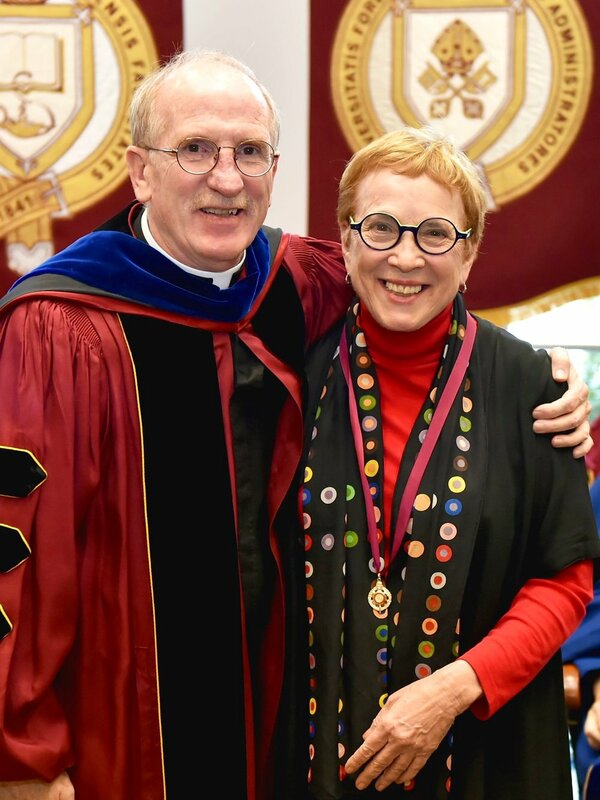 At the annual Convocation ceremony, held this year on March 10th at Lincoln Center, Professor Elizabeth Stone received the Bene Merenti metal for 40 years of service to Fordham University. Father McShane lauded Professor Stone, as well as the other award recipients, for not only touching every aspect of life at Fordham, but for also extending their good works to the world at large. “For Professor Elizabeth Stone, a story runs through it. There is her writing about storytelling: her book about family stories, and her beautiful, haunting memoir, A Boy I Once Knew, that braids her own story with the one told in volumes of diaries left to her by a former student after his death from AIDS. There is also her study of stories: her scholarship on biography and autobiography, and recently, her work on last wills and testaments, which, in an original turn, she shows to be a different kind of story, shaped from beyond the grave. Congratulations to Professor Stone, and thank you for all you do for your students, for the English Department, and for Fordham University.